International road racing superstar Guy Martin has confirmed his entry for next month’s Cookstown 100 road races. The Tyco Suzuki rider has been a regular at the national meeting in County Tyrone over the past few seasons and will kick-start his 2013 roads campaign at the event, which traditionally raises the curtain on the national season. Last year, Lincolnshire protagonist Martin was a somewhat controversial winner of the Open race on his Suzuki GSX-R1000 at Cookstown after home favourite Ryan Farquhar claimed his rival had made an illegal overtaking manoeuvre under a waved yellow flag. Despite his protestations the result stood, although Farquhar had the final say as he turned the tables on Martin to triumph in the Grand Final – a victory that would prove to be his final race at the Cookstown 100 after the KMR Kawasaki team boss called time on his career following the death of his uncle, Trevor Ferguson, at the Manx Grand Prix. Press officer Kenny Loughrin said he was thrilled to have Martin back at the Cookstown 100. “Guy has confirmed his entry for the Cookstown 100 on April 26-27,” said Loughrin. In Farquhar’s absence, Martin will line up on the grid on the narrow Orritor circuit as the race favourite based on his results over the past few years. His rivals are likely to include Michael and William Dunlop plus new KMR Kawasaki signing Brian McCormack from Waterford and team-mate Jamie Hamilton, Derek Sheils on Chris Dowd’s Kawasaki ZX-10R, Michael Pearson and Davy Morgan. Gary Johnston avec une MV F3 en supersport dans le team de Jack Valentine, ex manager du team Suzuki en WSBK l'année dernière pour la NW, le TT et l'UGP. Gary garde ses Honda pour le superstock et le superbike. Présence aussi Ryan MC Cay sur une autre MV engagée par le concessionnaire Robinsons of Rochdale avec le support de l'importateur anglais et de aussi de l'usine MV. Sans oublier Tim lui aussi sur une MV. Nineteen-time TT race winner John McGuinness has confirmed that he will race in this year’s Lightweight TT onboard Honda’s all new CBR500R. The race is scheduled to take place ahead of this year's PokerStars Senior TT, on Friday 7th June. 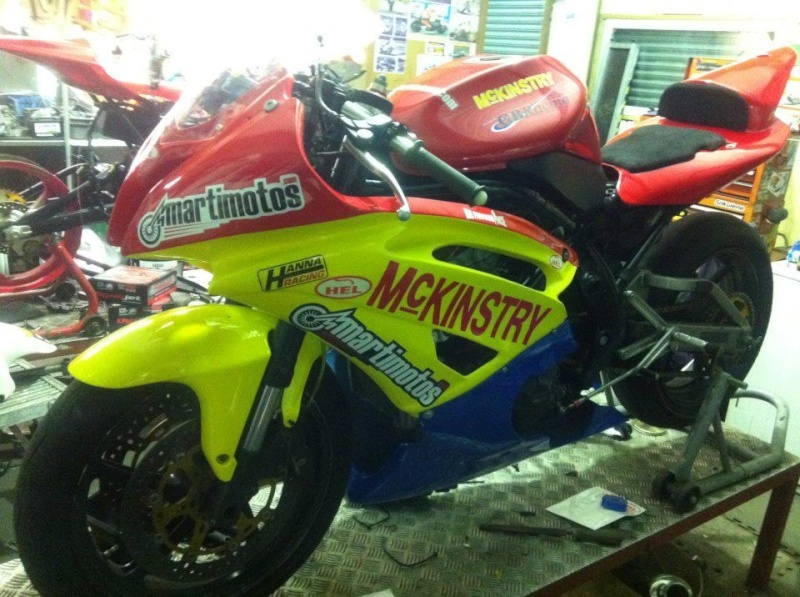 The Morecambe man will ride for Phil Morris's RLR racing team, which has already begun preparing the all-new CBR500R. McGuinness last road for the team close to a decade ago when he took back-to-back victories at the Lightweight TT onboard a Honda VFR400. The top eight positions in the 2012 event, the first TT run for SuperTwin machines, were all secured by Kawasaki riders, but the dynamic of the race is set to change in 2013 with McGuinness's entry. "It was strange sitting on the sidelines last year while the race was on, particularly as the Senior was cancelled as well. It's an interesting class and will present different challenges to the other races but I'm looking forward to having a crack. The team undoubtedly has a lot to do in a short space of time to be ready but I've got every faith in them." "The class continues to go from strength to strength and it will undoubtedly attract more interest this year with broader manufacturer involvement. John's entry will also further add to the race and I'm sure he'll be going all out to add to his TT titles." Martin Jessopp qui detiens le record envitesse de pointe a la Northwest avec 208MPH, soit 334,7km/hr espere atteindre 212MPH cette annee avec la BMW en ayant une bonne aspiration. West Country racer Martin Jessopp is eyeing a possible 212mph top speed at this year's North West 200 if conditions are right for his BMW S1000RR on the Golden Triangle. Jessopp, who blew through the speed trap at 208mph last year on the Riders Ducati, says that a good slipstream could see him push on to 210mph or even 212mph this year. "I broke the top speed barrier in practice last year. I was out on my own with no-one to slipstream and I hit 206mph on the first lap," said Jessopp. "It didn’t even get reported back to the pits because the guys with the speed gun thought that it couldn’t be working properly to record that speed so soon. I did the 208mph on the third lap. "My mechanics were really excited about it when I pulled into the pits but I was more concerned about getting the bike properly set-up for the race." Jessopp revealed that he had been struggling with ‘some handling issues’ during those runs down through the Coleraine Road speed trap on the Riders’ Ducati. But he admitted that it felt ‘very quick’. "When you are doing 180mph on a wide track like Silverstone it doesn’t really feel that fast but at the North West the road is so much narrower and everything is going past so quickly," he explained. "It is so bumpy and there is even a jump along the fastest stretch! It is like you are going down a tunnel and the white lines and hedges become a blur. University Corner appears like a tiny little dot in the distance and then all of a sudden you are there, pulling on the brakes like mad to get stopped and get around it." Cette semaine, en faisant mes courses dans un supermarché du pays de Gex, j'ai aperçu un "pur et dur" portant un joli blouson TT bleu et gris agrémenté de tous les logos qui vont bien. David Johnson and Karl Harris will contest the 2013 Isle of Man TT fuelled by Monster Energy after signing up to compete in all three 1000cc races for leading British Superbike team PR Racing Kawasaki. The pair will line up in the Dainese Superbike, Royal London 360° Superstock and PokerStars Senior TT races on board Kawasaki ZX-10Rs. Australian Johnson will be making his third appearance at the TT and having picked up five bronze replicas from five rides during his debut in 2010, as well as setting the third fastest newcomer lap ever, he deservedly picked up the coveted Newcomers Trophy for his efforts. After missing a year he was back in 2012 where he recorded two top 15 place finishes in the Dainese Superbike and Royal London 360 Superstock races, and a new personal best lap of 125.831mph. Harris made his TT debut last year and, like many of the short circuit stars who have turned their attention to the roads, he impressed on the Mountain course. Riding for the SMT Racing squad, the triple British Supersport Champion lapped in excess of 121mph on his way to 21st and a bronze replica in the Dainese Superbike TT, before backing this up with 28th and another bronze replica in the Royal London 360° Superstock race. Harris will contest this year’s British Superbike Championship for the Liverpool-based team, with Johnson competing independently in the National Superstock 1000cc Championship. Rico Penzkofer qui a pris sa retraite apres le dernier grand prix de macau engage son team pour la Northwest et le TT avec 4 pilotes, dont le suisse Herve Gantner. Le team est le champion du monde sortant en endurance, categorie superstock. A strong line-up of racers has been assembled by TeamPenz13.com for the 2013 Isle of Man TT fuelled by Monster Energy. German Endurance Superstock World Champion team will contest the three 1000cc races. Led by the recently retired TT racer Rico Penzkofer, the team will field four riders, with Steve Mercer heading the line up, ably supported by Swiss racer Herve Gantner, Japan’s Yoshinari Matsushita and exciting German newcomer Steven Michels. They will ride BMW machinery, with Mercer on the HP4 Superbike and the other three on the S1000RR. Mercer will come into his 5th TT keen to crack the top 10 for the first time having taken 12th place for the last two years in the Dainese Superbike race. Last year saw him record his best ever lap of the Mountain Course at 126.323mph, also earning his first silver replica. He will contest the Dainese Superbike, Royal London 360º Superstock and PokerStars Senior TT races. Gantner made his TT debut in 2010, and has already broken the 120mph barrier and picked up two bronze replicas. Having missed the 2012 races after injuring his hand in a practice spill, he’ll be looking to better his results of 2011 when he took a best finish of 27th in the second Monster Energy Supersport race. Matsushita is also coming into his 4th year of competition at the TT and both he and Gantner will line up in the same three 1000cc races as Mercer. The fourth member of the ambitious team is young German Michels, who will also contest the Dainese Superbike, Royal London 360º and PokerStars Senior races. The 22-year-old contested the International Road Race Championship last year where, despite missing the final round, he took an excellent 5th place overall in his first season of racing on the roads. After taking a win at the opening round at Schleiz, he went on to take further podium positions at Hengelo and Chimay and only finished outside of the top 5 once. A product of the Red Bull Rookies Cup, Michels has also been a regular top 10 finisher in the German IDM Superbike and Supersport Championships. Supportez Timothée Monot qui roule pour la seconde année au TT et la 3éme fois au NW200. Maria Costello au TT, a l'ulster grand prix et aussi en irlande, circuit et route avec une Triumph. Premiere course sur route avec la triumph a la Cookstown 100 fin avril et aussi en moto3, supertwin. Maria Costello MBE is targeting success on the roads after signing a deal to race for Bob Wylie Racing this year. "I am delighted to have Maria riding for me again this season. The 675R is set to be a very capable race bike and the Moto3 bike has recently had the HRC race kit fitted, which should provide a substantial horsepower increase. Maria went very well on it last season and I'm sure this season she will be even more successful on both machines." "My season has been given a real boost by this opportunity and I can’t thank Bob Wylie enough. I will savour every moment competing on these fantastic bikes and aim for yet more success on both of them." Confirmation de l'engagement de l'australien Josh Brooks pour la Northwest en preparation a sa 1ere participation au TT. After much speculation and anticipation, we can now confirm Josh Brookes will make his pure road racing debut this May at the International North West 200, alongside his enigmatic Tyco Suzuki team-mate Guy Martin. The British Superbike number two has been an avid road racing fan since joining the team in 2011, and despite already making his intentions clear to compete at this year’s Isle of Man TT Races in June – he is equally delighted to be racing at the team’s home international in May. “The North West 200 is another box I wanted to tick in my career and being my local race while I’m based in Northern Ireland, it’s going to be an exciting place to make my road racing debut. I’ve been asked many times this past few days what my expectations are, but until I get out there and sample the public roads and negotiate strange obstacles like road traffic roundabouts, I’ll not know what to expect. Team Manager Philip Neill firmly supports Brookes’ claims regarding their responsibility in British Superbike, but with nigh on twenty career wins at the Triangle, and it also being his favourite race of the year – the Moneymore man and his father Hector are excited at the prospect. En voila un autre qui continue de préparer sa saison , c'est Timothée (Tim la casse) , Il a roulé à croix en Ternois le week-end du 13-14 avril, durant une manche du championnat Belge afin d'engranger les kilomètres au guidon de sa belle italienne ! Tim a roulé à Croix en Ternois en Championnat Open Belge pour parfaire les réglages de sa MV F3 Optimark et avoir le nombre de courses nécessaires à l'obtention de sa "Mountain Licence" obligatoire pour le TT et le MGP, il reste du travail à effectuer, c'est pourquoi le team Optimark sera à Spa les 27 et 28 Avril pour des tests à haute vitesse plus en rapport avec la North West et le TT. Il y aura un autre pilote français Xavier Denis qui roulera en Superstock (Kawasaki ZX10R) et en Supersport (Yamaha R) avec le N°82. Timothée roulera dans 2 catégories: Supersport avec sa MV F3 Optimark avec le N°76 et en Lightweight TT avec une Kawasaki ER6 Martimotos louée à McKinstry Racing avec le n°65. Mickey, tout le team Milwaukee etais a Cadwell park, y compris Josh Waters et james Ellison. Guy Martin, passage interressant concernant le fourche Ohlins factory. Suite a sa chute a la Horrice 300 le weekend dernier, Michael Pearson ne participeras pas au TT.